Terry’s analysis of the proposed changes to OCLC’s record policy is essential reading. I’m really concerned that these 996 fields will slip somewhat unnoticed into data that I use. This appears to be an engineered, legal virus for our bibliographic ecosystems. I’m not a lawyer, so I can’t fully determine the significance of these legal terms…mostly because there isn’t a policy at the end of that PURL right now. There’s a FAQ full of ominous references to “the Policy”, and a glossy, feel-good overview, but the policy itself is empty at the moment. So the precise nature of the virus is so far unknown…or am I wrong? At any rate, I think libraries need to be careful about letting these 996 fields creep into their data–especially data that they create. I wonder are there other examples of legalese that have slipped into MARC data over the years? Update 2008-11-03: it appears that “the Policy” was removed sometime Sunday evening? Perhaps its best not to jump to conclusions eh? 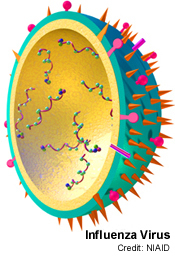 But that image of the virus is too cool, and I needed an excuse to post it on my blog. Update 2008-11-07: check out Terry’s re-analysis of “the Policy” when a new version was brought back online by OCLC.